I’ve always had a knack for messing up words. Well, not really messing up words as much as improving upon them. It runs in the family. My mom once referred to online social networking with the impressively utilitarian word “spacebook.” I have always called cardamom “cardamon.” And even after I knew the right way to say it, I kept saying it the wrong way because it didn’t sound as weird. I say it a lot; it’s one of my favorites. I get corrected and stick with my version. I’m stubborn (that runs in the family too). That’s why canning is good for me. I can’t do it my way, I have to follow the rules. I did sneak in a little customization here–after my canning gurus said it was ok–the cardamon cardamom. Stubborn, I tell you. 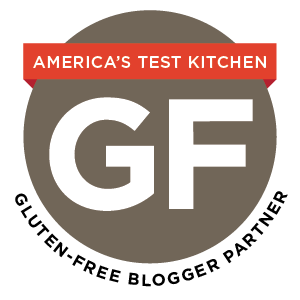 I adapted this recipe from the National Center for Food Preservation. If you’ve never canned before, I’d suggest you can for the first time with someone more experienced and definitely visit the National Center for Food Preservation site. 1. Place plums, sugar, water, lemon juice, and cardamom in a medium pot over med-high heat. 2. Use a potato masher or the back of a slotted spoon to crush the plums as they heat. Don’t worry if you don’t get them completely mashed. They will break down further as the mixture cooks. 3. Bring to a boil and heat until mixture reaches 220 degrees. Stir to prevent burning and turn it down a bit if you need to. If you’re like me and don’t have a thermometer, use one of these methods to check if you’ve reached the jellying point (220 degrees). 4. Process in a water-bath canner according to these instructions. Makes 4 half-pints. This jam sounds delicious. I was wanting to use cardamon with plum but didn’t know how much to use. So thanks for this. I have plums waiting to go in the pot. Thank you! I’m so glad it was helpful. As for the cardamom flavor, it’s not super pronounced, but definitely there. I ripped open some cardamom pods for the first time a few weeks ago for pickling. I hadn’t thought to drop them into a jam. 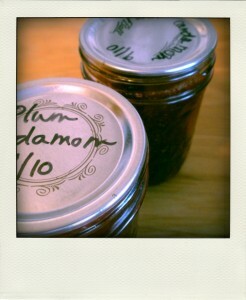 Bring a jar tomorrow and we’ll swap plum jars if you’d like. 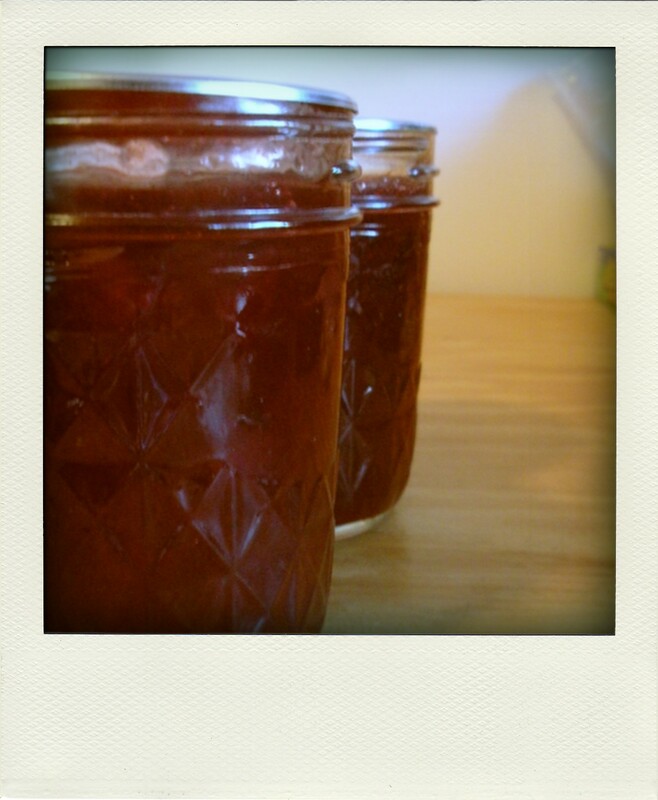 I made some plum cardamon jam that only required 1/2 cup honey as the only sweetner. I like it a lot. I’m still amazed it works…of course a pack of Certo didn’t hurt. MMMMMM,..This plum cardamom jam sounds wonderful!! I love the used flavours in here,..the cardamom makes it very special. These would also make great food gifts! This jam was sooooo delicious! Thanks for bringing it along on your visit. I am really getting into the cardamom thing, and this sounds like a wonderful jam. I’ll remember it for next summer. The other day I was at Peet’s Coffee and saw their packaged “cardamon” for sale, so you are in excellent company. Also, my dad recently referred to social networking sites as “MySpaceFace.” We may come from similar word-twisting stock!